Floridaâ€™s leading newspaper The Sun Sentinel says plans for a new private air terminal at the Robert L. Bradshaw International Airport comes as the twin-island Federation expands and upgrades its tourism industry. 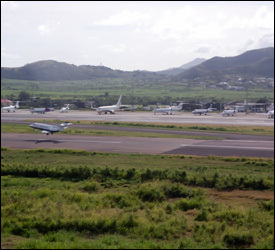 Plans call for construction by London-based Veling Limited, with ownership transferred to the governmentâ€™s St. Christopher Air and Sea Ports Authority (SCASPA) at the end of the concession contract. â€œThe venture comes as St. Kitts expands and upgrades its tourism offerings, with new hotels and resorts and such attractions as beaches, golf, tennis, casinos, tropical rain forests, a railway connecting sugar plantations and tours of the Brimstone Hill Fortress National Park, a UNESCO-designated World Heritage site,â€ wrote Hemlock in the Travel Section of the Sun Sentinel.